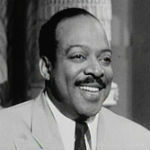 Count Basie (August 21, 1904 – April 26, 1984) was an American jazz pianist, organist, bandleader, and composer. His mother taught him to play the piano and he started performing in his teens. Dropping out of school, he learned to operate lights for vaudeville and to improvise accompaniment for silent films at a local movie theater in his home town of Red Bank, New Jersey. By 16 years old, he increasingly played jazz piano at parties, resorts and other venues. In 1924, he went to Harlem, where his performing career expanded; he toured with groups to the major jazz cities of Chicago, St. Louis and Kansas City. In 1929 he joined Bennie Moten‘s band in Kansas City, and played with them until Moten’s death in 1935. In 1935, Basie formed his own jazz orchestra, the Count Basie Orchestra, and in 1936 took them to Chicago for a long engagement and their first recording. He led the group for almost 50 years, creating innovations like the use of two “split” tenor saxophones, emphasizing the rhythm section, riffing with a big band, using arrangers to broaden their sound, and others. Basie’s theme songs were “One O’Clock Jump“, developed in 1935 in the early days of his band, and later “April in Paris“.